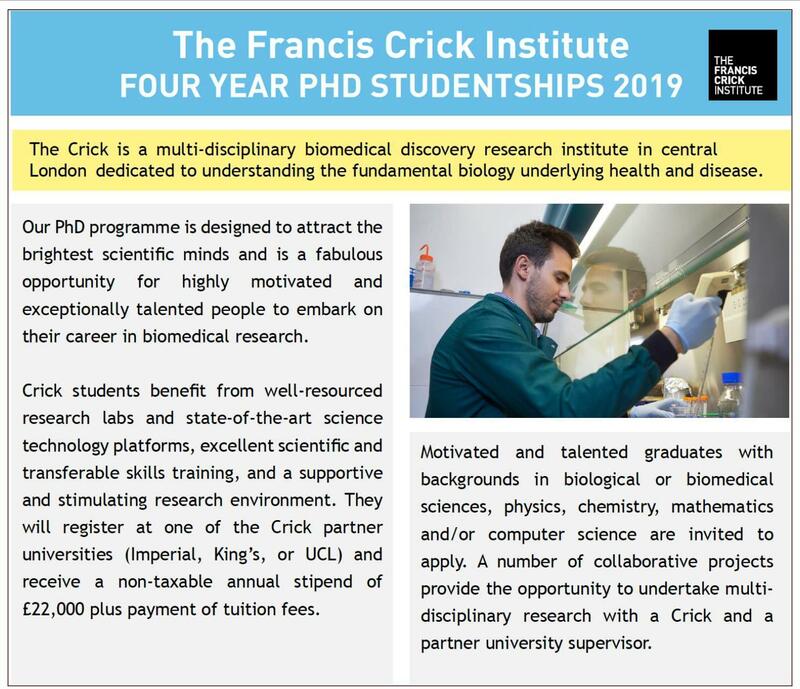 The Francis Crick Institute 4-year PHD Studentships 2019: Now Open! The Crick are looking for talented and motivated graduates with backgrounds in biological or biomedical sciences, physics, chemistry, mathematics or computer science to join the 2019 Crick PhD programme. Candidates of all nationalities can apply for the Crick PhD programme and studentship. A first/upper second-class honours degree (or equivalent from a non-UK university) in a relevant subject. Appropriate research experience as part of, or outside of, an undergraduate or master’s degree course in a relevant subject. Interviews will take place at the Crick on Monday 21 and Tuesday 22 January 2019. Any queries should be directed to: student-recruitment@crick.ac.uk.